The early registration deadline for the World Congress on Oleo Science & 29th ISF Congress has been extended to September 10, 2012. WCOS 2012, held in Japan, offers an internationally recognized scientific program and celebrates the 60th anniversary of the founding of JOCS as well as the 50th anniversary of the Annual Meeting. 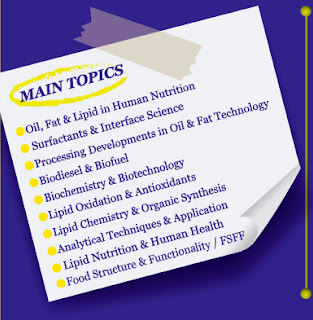 AOCS past-president Edward Emken will present " Human Studies Using Isotope Labeled Fatty Acids: Answered and Unanswered Questions" as a part of the prestigious ISF Plenary Lectures. Should Lawyers Drive Food Safety? Adult Obesity Rates in the U.S.